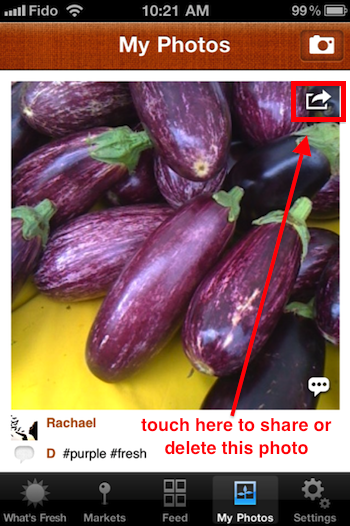 This weekend our app sees it’s second full weekend of farmers markets, and one of the things we heard from early users was that it wasn’t clear that photos could be shared on social channels. 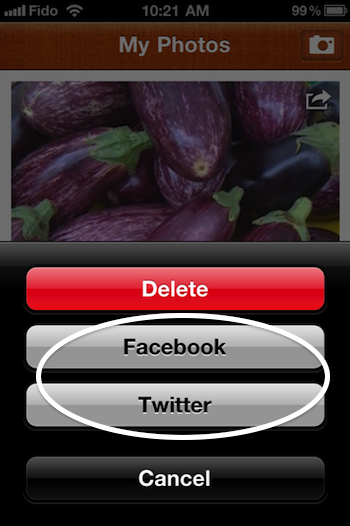 One of the reasons peoples are using the app is to promote fresh food in their communities. That sharing includes our friends and followers on Twitter and Facebook. Many food lovers are in both places, and not everyone has an iPhone so sharing these photos on those networks gives people a quick connection to their local food community using the web. 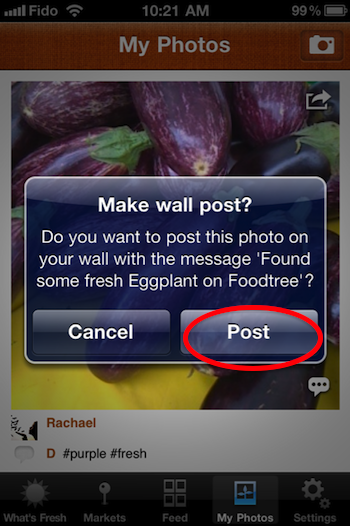 When you take a photo using the Foodtree app, it ends up in your My Photos stream. Go there to find a photo to share. Hint: You can share other people’s photos too! 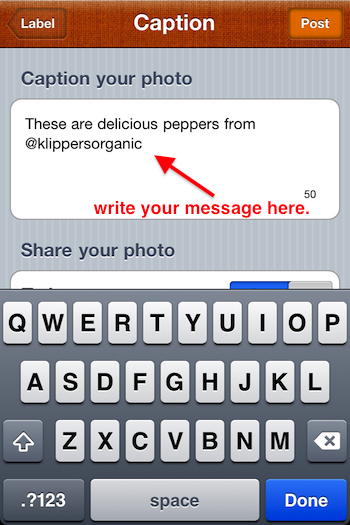 Press that button and you’ll see options to share via Twitter or Facebook. 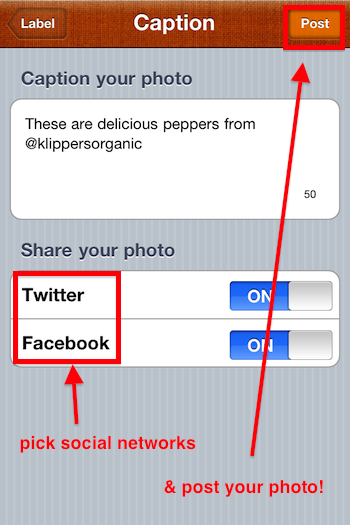 When you choose either one, you’ll be sent to Twitter or Facebook to confirm that you want to share it on those networks. By logging in and clicking “Okay” or “Authorize App”, all you’re giving our app permission to do is share the photos you decide to share. We won’t touch your social accounts otherwise. So that’s it! If you have questions, please feel free to leave them in the comments or shoot us an email at friends@foodtree.com! Have a great weekend at the farmers markets! Without even mentioning a specific prize, in a few short hours our followers had retweeted and recommended us over and over. We crossed the six hundred mark easily. What I found most compelling was that it wasn’t a handout spree; the people who started following us all seemed (and continue to be) interested in food and our relationship with it. Congratulations to LovelyAnomaly and Hilary and thank you both for following us! I’m looking forward to finding some great local snacks to send your way. I’ll reach out to you both soon, or you can email me (if you get hungry!) at derek@foodtree.com. After all the fun I had, I’m wondering if we should make small food giveaways a regular thing? We spend a lot of time here researching local food systems, and this could be a fun way to introduce you to the food being made near you.